About the Project - Make Your Mark on the World. Make a Pledge, Educate a Child. The “Make Your Mark on the World” outdoor art exhibition on June 17th, 2011, was the first event in the two-part campaign which began with the creation of a one-of-a-kind 6x11 paneled mural of the world by respected graphic artist Joseph Kilrain. We welcomed the public at Union Square to place their fingerprints on the map to indicate areas of the world they wanted to help and give personal reflections on making a meaningful mark on the world for a Jubilee Project video meant to inspire action and giving for education. We collected more than 200 fingerprints, raising over $300 in funding through sponsors. Dozens of interviews were also conducted for the Jubilee Project video, set to debut on the night of the gallery opening. To conclude the campaign, the 30 panels of the mural, complete with the fingerprints, will be sold and auctioned on Friday, July 29th, 2011, at a private art exhibition and partneship launch event. The goal is to raise $20,000 to support Givology children and projects around the world. The event will also feature artwork of students from all Givology partner schools around the world, highlighting artwork from students at the Buen Pastor convent in Guanajuato, Mexico. Givology, a global education non-profit, partnered with the Jubilee Project and respected graphic artist Joseph Kilrain to bring you "Make Your Mark: Live Art Display" in Union Square, NYC on Friday, June 17th. Joseph Kilrain, CCO of Gigapixel Creative created a large artistic rendering of the world map, and during the display, community members were invited to contribute by placing a fingerprint on the map where they would like to help educate a child. We are sending 100% of the funding we raised to schools in the geographic area(s) you chose. Jubilee Project, a non-profit which focuses on creating videos that inspire change, captured many stories about small acts of kindness that have changed lives and will feature them in an impactful video debuting at the exhibition event in July. 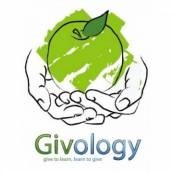 Givology was founded by University of Pennsylvania students (now alumni) to empower individual donors to connect with students and schools in need. By leveraging the Internet to support education grants and projects (such as constructing schools, teacher training, building libraries, etc. ), Givology creates a global community of people connected through their belief in education. Notably, we care a lot about making giving both transparent and highly personal, allowing any donor to track his or her impact and build 1x1 connections with our students and projects through our online community. We democratize philanthropy by enabling anyone to help impact the lives of students in need of educational assistance. As a 100% volunteer-driven organization, we pioneer a new model of crowd-sourcing philanthropy. Since our launch, we have raised over $130,000 to support over 2,635 students in 20+ different countries through 40+ grassroots partners. To date, Givology has 4,000+ supporters on Facebook, Linked-in, and Twitter, 1,700+ registered donors, 12 chapters started at universities, high schools, and various cities, 30 core team members and 90 volunteers globally. In addition, Givology received the Intelius Award for Best Student-Run Social Enterprise and a Top Education Non-Profit rating from Great Non-profits, and has been featured in MTVAct, Nicholas Kristofs book Half the Sky and his blog in the NYT, Knowledge@Wharton, among other media publications. The Jubilee Project makes videos for a good cause. Our vision is to make entertaining videos that will empower, enable, and inspire others to do good as well. This idea was born out of the aftermath of the Haiti earthquake in January 2010. Jason and his friends decided to busk in a New York subway station and they made a video of it that raised over $700 for Haiti earthquake relief. Encouraged by the result, since then we (Jason, Eddie and Eric) have joined together to continue making videos for a good cause. Jason does consulting with Bain, Eddie creates videos for the Obama campaign and the Department of Education, and Eric is a student at Harvard Medical School. Our diversity of backgrounds allows us to bring a variety of experiences to the table, but what unites us is our passion for social justice and filmmaking. But The Jubilee Project is more than just 3 guys and one camera. The work we do goes beyond us and certainly requires all of us together, united, with a common goal of doing good. Born and raised in South Philly, Joey Kilrain’s artistic style evolves as a product of his ongoing life lessons. He integrates traditional media such as acrylic, pen & ink, papier mâché with mobile & web technologies. He cut his teeth at Art Institute of Philadelphia and SVA. His work has been exhibited in New York City at Ward Nasse, Church of St. Paul the Apostle, ArtBreak Gallery, Governors Island, Art Gotham, Haven Arts. His work has been published in Adobe’s Web Design Journal, Village Voice, and New York Magazine.